Being a librarian could be your dream job. Do you wish you could work in the stacks of the New York Public Library? Or maybe among the ancient manuscripts of The Morgan Library and Museum? Or even just help children find just the right book to read. For those who love books and who love to read, being a librarian might be a good fit. If you’re considering a job as a librarian, here are some facts from the U.S. government about the profession. A librarian needs master’s degree in library science (a bachelor’s degree in any undergraduate subject is acceptable in order to enter a graduate program in library science); the masters degree usually takes 1 to 2 years to complete. Colleges and universities have different names for their library science programs, like Master’s in Library Science (MLS) programs or Master of Information Studies or Master of Library and Information Studies. Many colleges offer library science programs, but, as of 2011, only 56 programs in the United States were accredited by the American Library Association. A degree from an accredited program may lead to better job opportunities. Librarians working in a special library, such as a law or corporate library, usually supplement a master’s degree in library science with knowledge of their specialized field. They may earn a master's or professional degree or a Ph.D. in that subject. In small libraries, librarians are often responsible for many—or even all of—the aspects of library operations mentioned above. In larger libraries or library systems, librarians usually focus on a specific area, such as user services, technical services, or administrative services, as described below. User Services Librarians — help patrons find the information they need. They listen to what patrons are looking for and help them research the subject using both electronic and print resources. User services librarians also teach patrons how to use library resources to find information on their own. 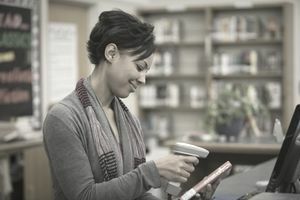 This may include familiarizing patrons with catalogs of print materials, helping them access and search digital libraries, or educating them on Internet search techniques. Technical Services Librarians get, prepare, and classify library materials. They organize materials to make it easy for patrons to find information. These librarians are less likely to work directly with the public. Administrative Services Librarians have managerial roles in libraries. School Librarians, sometimes called school media specialists, work in elementary, middle, and high school libraries and teach students how to use library resources. They also help teachers develop lesson plans and find materials for classroom instruction. Special Librarians work in settings other than school or public libraries. They are also sometimes called information professionals; their jobs are to collect and organize materials focused on their specific subjects. Law librarians help lawyers, law students, judges, and law clerks locate and organize legal resources. Medical librarians help health professionals, patients, and researchers find health and science information.